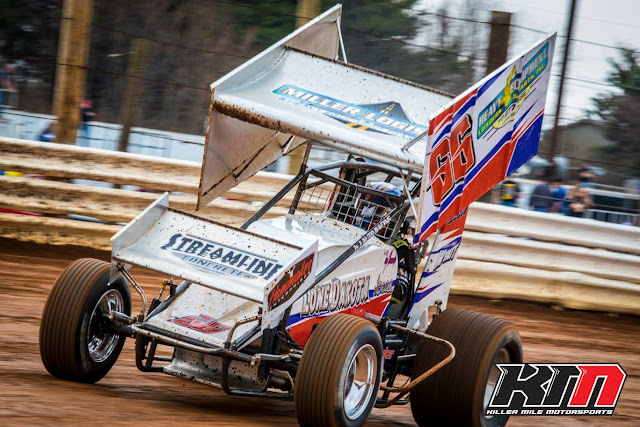 ABBOTTSTOWN, PA 4/1/2017 – When Brian Montieth became the third leader of the race on lap 21 Saturday, everyone figured that would be game over in the 25-lap 410 sprint car feature at Lincoln Speedway. But Chase Dietz didn’t get the memo. Dietz, who started seventh two rows behind third-starting Montieth, caught Robbie Kendall for second a lap later, and drove around Montieth for the lead several times in mid-lap, but couldn’t make it stick at the line each time by. On the final lap coming off turn four, Dietz went to the top and pulled alongside the Jerry Parrish-owned #21, but couldn’t make the pass, crossing a foot (.029 seconds) beside him at the checkered. Handicapping placed Tim Glatfelter on the pole for the start and he led the first eight laps. Second-starting Kendall chased him throughout the early stages and got by into the lead on lap nine. Montieth ran third the whole way until Cory Haas spun on lap 17. Over the next four laps, Montieth began to kick in, putting pressure on Glatfelter for second and then after leader Kendall. Third through fifth were Kendall, 11th-starting Lucas Wolfe, and Glatfelter. Sixth through tenth were Alan Krimes, Danny Dietrich, Jim Siegel, Billy Dietrich, and 18th-starting Bill Balog. Heats for the 25 410 Sprints were won by Montieth, Krimes, and Siegel, with Kyle Reinhardt winning the consolation. 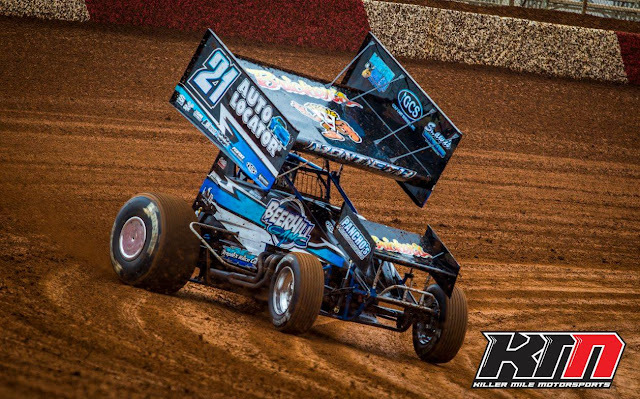 Carlisle’s Doug Hammaker followed up his second-place finish from opening night with a win in the 20-lap 358 sprint car feature. That moved him one win past his dad Dale on the all-time Lincoln win list. Kyle Denmyer, who started fourth, drove around everyone (including polesitter Hammaker) on the opening lap and led the first three circuits. Hammaker regrouped and claimed the lead on lap four, leading the rest of the way for the 1.91-second victory over Denmyer, with Chandler Leiby, opening night winner Kevin Nouse, and Cody Fletcher completing the top five. Heats for the 30 358 Sprints were won by David Holbrook, Denmyer, and Jared Esh, with Shane Smith winning the consolation. Justin Cullum scored his first career Lincoln win in the 20-lap All-American Outlaw season opener. Travis McClelland started on the pole and led the first ten laps before Cullum took over and led the rest of the way. McClelland settled for second, with Jim Minter, Tim Fake, and Jeff McCauley rounding out the top five. Heats for the 13 All American Outlaws were won by McClelland and Cullum. Next Saturday, April 8th, Lincoln Speedway continues 6 PM starts and with another 3-division racing program as the 410 Sprints and 358 Sprints are joined by the Street Stocks. Gates open at 4 PM, with hot laps getting underway at 5:30 PM. To get all the latest news, results, schedule changes and rule changes, visit Lincoln Speedway's website at http://www.lincolnspeedway.com to stay up-to-date on all the action or pending weather conditions at Central Pennsylvania's "Premier" Saturday night race track - The Fabulous Lincoln Speedway. 410 Sprint Feature Finish (25 Laps) – 1. 21-Brian Montieth ($3,200); 2. 5G-Chase Dietz; 3. 55K-Robbie Kendall; 4. 24-Lucas Wolfe; 5. 69-Tim Glatfelter; 6. 87-Alan Krimes; 7. 48-Danny Dietrich; 8. 59-Jimmy Siegel; 9. 8-Billy Dietrich; 10. 17B-Bill Balog; 11. 44-Trey Starks; 12. 5-Tyler Ross; 13. 99m-Kyle Moody; 14. 2w-Glenndon Forsythe; 15. 91-Kyle Reinhardt; 16. 51-Freddie Rahmer; 17. 39m-Anthony Macri; 18. 1X-Chad Trout; 19. 21T-Scott Fisher (DNF): 20. 88-Brandon Rahmer (DNF); 21. 39-Cory Haas (DNF); 22. 16c-Matt Campbell (DNF); 23. 69H-Shane Hoff (DNF); 24. 74-Dwayne Gutshall (DNF) No Time. 358 Sprint Feature Finish (20 Laps) – 1. 66-Doug Hammaker ($1,000); 2. 38D-Kyle Denmyer; 3. 119-Chandler Leiby; 4. 1J-Kevin Nouse; 5. 66A-Cody Fletcher; 6. 27S-Adrian Shaffer; 7. 5-Phil Walter; 8. 28-Matt Findley; 9. 89-Ashley Cappetta, 10. 41-Jeff Halligan; 11. 23J-Jake Eldreth; 12. 23R-Todd Rittenhouse, Jr.; 13. 12-Brent Shearer; 14. 7-Trey Hivner; 15. 00-Chris Frank; 16. 9-Dalton Dietrich; 17. 00s-Shane Smith; 18. 77-David Holbrook; 19. 30-Jared Esh; 20. 19-Troy Wagaman, Jr; 21. 59-Steve Wilbur; 22. 74-T.J. DeHaven; 23. 19G-Todd Gracey (DNF); 24. 511-John Sharpe (DNF). No Time.